I’ll bet your dashboard radio has pretty good speakers? Wouldn’t it be nice if you could hear your laptop’s navigation program speak thru those speakers instead of the computer’s speakers? How about your smart phone? If you’re like us, you’ve found all sorts of podcasts, radio shows and other apps and websites that have sound. We like to listen to our favorite RVing podcasts on our Droid phones while we’re on the road. If we depended on the speakers on our phones, we wouldn’t be able to hear over the road noise. Turn the Jupiter Jack on – you should see a red light – and plug it into the audio out jack – the same place you would plug in headphones. 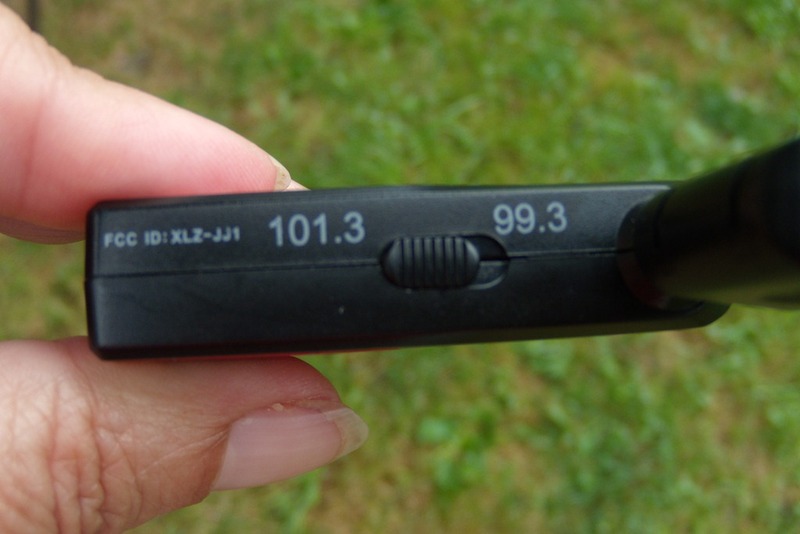 Notice the frequency setting that is set on the Jupiter Jack (ours can be set to either 99.3 or 101.3. Just tune your radio to the same frequency and you should be hearing the music, or podcast, or whatever is on the phone. If one of the frequencies has a broadcast station on it, try the other. How much does this little doohickey cost? Just $10 – maybe less in the discount bins at Best Buy. Jim picked ours up at Bed, Bath, and Beyond for $3! Caveat: I read some reviews that say it doesn’t work with all phones as advertised. 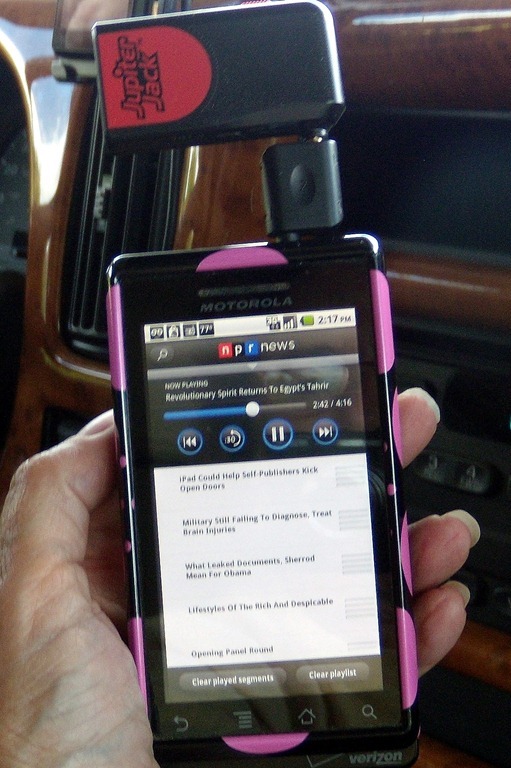 All I can tell you is that it works great with our Motorola Droids and it opens up a whole new avenue for radio entertainment as we drive. We’ve cancelled our satellite radio. How would you hook this up to the computer for added volume on streets & trips? you plug it into the computer’s headset jack. So, I’m guessing that the frequency switch doesn’t matter what position it is in. What matters is that the switch on the Jupiter Jack and the frequency that the radio is tuned to are one and the same.